Best-in-Class performance at video surveillance includes a shift towards proactively managing and responding to situations as they unfold, rather than reactively figuring out what happened after the fact. By investing in enabling technologies such as video analytics, the top performers are actually spending about 67% less than all others on a per-camera basis, and their guard force is successfully assessing, prioritizing and taking action on 5-times more alerts per camera per day. Today’s corporate leaders face multiple challenges, including the need to innovate in extremely competitive business climates, address highly dynamic regulatory and compliance challenges, and secure the enterprise against a wide barrage of new and evolving sophisticated threats. Security is a major consideration in the way that business and information technology systems are designed, built, operated, and managed. Organizations often take a bottoms-up approach to security and continually build on top of their existing security investments. This technology-centric approach often creates an excessively complex and disjointed security infrastructure that is difficult to manage and prone to operational inefficiencies which can escalate IT costs. The need to be able to integrate security with business functions and operations exists more than ever. A Business-Driven approach can achieve end-to-end security that supports business goals such as driving innovation and reducing organizational costs, as well as operational requirements to address compliance measures, protect against internal and external threats, and prioritize the security risk management activities that make the most sense for their organization. In this webcast presentation we will address how to implement a solid Business-Driven security strategy within your organization. The trends towards a more dynamic user experience and integration with back-end services are powering even more complex web applications – a rise in enterprise mobile applications as well. All of which makes deciding which approach(es) to use for application security is a multifaceted business decision – one part context, one part judgment, and one part philosophy. Embedding security from the beginning of the software development lifecycle is not for everyone, but Aberdeen’s research confirms that it does yield the best results. This presentation provides insights into the benefits and tradeoffs of addressing security as part of the software development lifecycle. This panel will tackle the unique challenges faced by businesses in Financial Services as they try to enter the growing mobile app market. We will bring together perspectives from vendors and researchers focusing on the topic and end users implementing the solutions and dealing with the day-to-day challenges. In this short video session, Aberdeen analysts Andrew Borg and Derek Brink address questions about their recent research in the area of Bring Your Own Device (BYOD) and IT Security. BYOD's rapid adoption is widely discussed, but a thorough examination of its actual cost to the organization has been lacking. Expanding mobile access to the greatest number, within the constraints of capital equipment budgets, is one of the undeniable benefits of a well-managed policy. But BYOD also brings significant challenges: the increasing power and complexity of devices adds to the cost of support; cost controls are disaggregated; and new risks regarding security and compliance. Aberdeen Group describes a best practices approach to address these concerns, derived from its recent study of more than 560 organizations in 45 countries. "Right to Choose" vs. "Right to Wipe" – which sounds like a polarizing election-year issue – refers to the tension between enterprise end-users wanting to use their own smartphones and tablets to access enterprise resources, and enterprise IT departments wanting to ensure that they can centrally lock / erase / wipe enterprise data if the device is lost or stolen. This presentation summarizes an Aberdeen Group analysis of more than 430 organizations, which indicates that end-users are actually most productive and most satisfied when they have the freedoms of BYOD, but within certain boundaries and protections. Are your cloud concerns valid? This panel will focus on identifying the major perceived barriers to business adoption of cloud computing from the perspectives of security, compliance, privacy and policy. The goal is to separate founded and unfounded concerns and help IT security professionals and C-level executives make educated cloud decisions for their business. In its fifth annual study on best practices in data loss prevention (DLP), Aberdeen analyzed and compared the results from more than 600 organizations which have adopted one of four distinct approaches to the operational use of DLP technologies. The best approach, in terms of balancing enterprise risk and reward, is like the ideal referee in sports: one that makes good calls and enforces the rules regarding safety and fair play, but generally doesn't get in the way of the people playing the game. Consumerization of IT and BYOD represent an opportunity and a challenge for businesses. At the crux of the issue is the tension between enterprise IT professionals who are tasked with establishing and enforcing policies and end-users who care about mobility and freedom anytime, anywhere. This webinar will explore how establishing the right BYOD policy can help a company embrace the consumerization of IT while keeping their enterprise secure. So you've successfully gotten started with your application security initiative -- now what? How do you take securing your applications to the next level? Research from Aberdeen Group confirms that bringing about a systemic change across the entire software development lifecycle -- i.e., to become "secure at the source" -- yields the best results. In addition to the use of several enabling tools and technologies -- including application vulnerability scanning, penetration testing, manual source code reviews, static source code analysis and verification, and dynamic source code analysis and verification -- this webinar will review the "people and process" capabilities that most strongly differentiate the top performers. Two publicly disclosed attacks on the infrastructure for issuing SSL Server Certificates made headlines in 2011 â in large part based on the evidence that they were part of a state-sponsored effort to hijack the trust of legitimate domain names, and thereby gather private or sensitive information from its unsuspecting citizens. From the perspective of the countless enterprises that rely upon the global foundation of trust provided by SSL Server Certificates, however, the three key implications should be a renewed preference for top quality Certification Authorities, a continued shift toward higher assurance EV SSL Server certificates, and a higher priority for assessing the risk of current certificate revocation mechanisms. Perhaps one of the most overlooked areas for improved key management involves deployments of SSL Server Certificates and Extended Validation (EV) SSL Server Certificates â the latter which require a more rigorous vetting process to confirm the identity of the requesting site owner before being issued. Aberdeen's research shows that leading performers were 1.7-times more likely than lagging performers to have current deployments of EV SSL Server Certificates, providing their end-users with a higher level of assurance of a legitimate web site and greater confidence in conducting online transactions. The threat landscape is escalating, and the nature of vulnerabilities and threats is changing. If your strategy has been to assume that your organization is immune, you may want to consider the latest evidence to adapt. Join an expert panel of OWASP leaders as they discuss new web application threats and give their insights on ways to secure them for your business. In a study of more than 160 organizations, Aberdeen found that respondents annually spend an average total of $2,150,000 in IT Security-related activities: $870,000 invested in their IT Security initiatives, plus an additional $1,280,000 in costs related to IT Security incidents that were not avoided in spite of these investments. This works out to approximately $220 per employee per year, or roughly 0.2% of annual revenue – less than many companies spend on complimentary tea and coffee. But how have some companies successfully optimized the balance between their annual investments in IT Security initiatives, and the additional financial impact of IT Security-related costs not avoided – the very essence of a risk-based approach? Companies of all sizes are trying to make sense of the incredible volume of data that is being generated by their computing infrastructure and their existing security solutions. Much like the children ice-skating game of "crack the whip", Aberdeen's research indicates that closing the performance gap between leaders and laggards in the front-end – i.e., collecting and managing the data (log management) – helps to accelerate the progress needed in the back-end – i.e., interpreting the data and taking action (security information and event management). Before (or after) the presentation, individuals interested in comparing their own organization's strategies, capabilities and use of technologies with those of the Best-in-Class (top 20%) as seen in Aberdeen's benchmark research are invited to visit a complimentary, easy-to-use online assessment tool at http://assessment.aberdeen.com/BF3G7hKBmi/index.aspx . 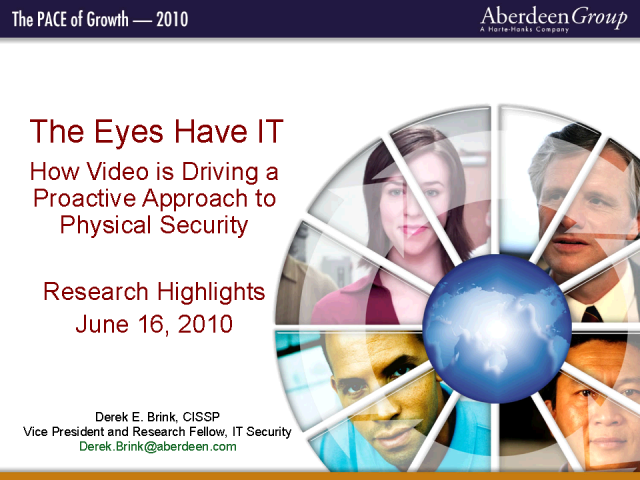 Aberdeen's fourth annual study on data loss prevention –published on June 30, 2010 – presents the challenges, strategies, best practices and year-over-year comparisons of Best-in-Class organizations in safeguarding their sensitive data using content-aware data loss prevention technologies. The presentation will show how the companies achieving top results successfully use content-aware technologies to identify sensitive data across multiple channels, and how they use a range of remediation options to enforce their established policies. In doing so, they also experienced the benefits of fewer incidents of data loss or data exposure, fewer audit deficiencies, and lower operational cost. What separates "Best-in-Class" (top 20%) organizations from their "Industry Average" (middle 50%) and "Laggard" (bottom 30%) counterparts when it comes to various topics in IT Security? Aberdeen's unique, fact-based approach to market research provides a framework for end-user organizations to benchmark their own strategies, capabilities and use of enabling technologies against companies with top performance. Areas of coverage in Aberdeen's IT Security practice include topics in Identities and Access, Data Protection, IT Infrastructure Security (including Endpoints, Delivery Platforms, Applications and Databases, Networks, and Storage), Physical Infrastructure Security, Policies, and Security GRC (Governance, Risk Management, and Compliance). Complimentary access is provided to the full benchmark research reports, for a limited time after initial publication.